Barcelona is a multi-faceted city that can be examined through numerous prisms. There are itineraries of every kind to suit every taste: historical and architectural routes for discovering the city's evolution and development, nature routes for enjoying the numerous green spaces and landscapes that embellish it, cultural routes that invite you to experience a city forever keen to cultivate itself and so on. There's no end to the offerings! There are around one hundred parks and gardens in Barcelona. Some, like Parc del Guinardó, are enormous, whilst others are like patches that bring a little green to the city’s fabric of buildings and streets. There are themed parks, forest parks, historic parks... Each has formed a special bond with the local area, and together they all help to make the city a place for meeting, leisure and learning in the open air. This route takes us around some of the city’s less well-known parks and gardens. Bajarí is what Barcelona's gypsies called the Catalan capital in their language, Calo. It is probably one of the most enigmatic and unknown sides to Barcelona: one that safeguards the legacy of a charismatic culture which still keeps its ancestral traditions. Gypsy Barcelona includes unique spots in neighbourhoods such as Hostafrancs, Gràcia, Raval and Barceloneta, where you can explore the bajarí soul. Contemporary Barcelona has the gift of ubiquity: it crops up, as a surprise, here and there, in the centre of the most far-flung neighbourhoods, coexisting, perfectly integrated with the historical city, with old squares and antique buildings. It means you have to raise your eyes up high, scrutinise the city and sniff the aroma of the avant-garde to find evidence that Barcelona is, as it has always been, a deeply aesthetic and richly creative city. 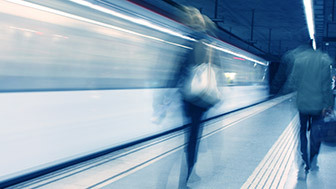 The point where Gran Via and Avinguda Diagonal intersect has become the nucleus of a new commercial and business area. The area surrounding Plaça de les Glòries is full of hotels, cultural centres, the head offices of large multinationals and shops. 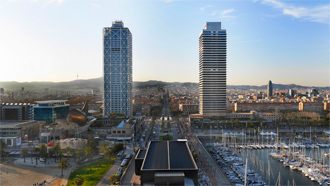 Here avant-garde buildings such as the Torre Agbar and the striking Design Hub stand alongside century-old factories, the old narrow streets and community life. Welcome to Glòries. If designing were merely about beauty and originality, Barcelona would win by a landslide in any international competition. But designing is also, and above all, a way of understanding life: a tool for transforming spaces and landscapes, sublimating them while also making them accessible and useful. It is here too that Barcelona wins hands down. The entire city is a treat for the eyes as well as a paradigm of urban ergonomics. Avda Diagonal crosses Barcelona from west to east: from the lower part of the Pedralbes neighbourhood to the sea, in the Zona Fòrum.Travelling along its 11 km is a journey through Barcelona's varied architecture: it is here that the masterpieces of Modernisme, rationalism and the most innovative contemporary architecture converge. The promenade is full of shops, good restaurants and venues offering entertainment. Barcelona is an eminently literary city, and many writers have portrayed the Catalan capital in their works. Moreover, Barcelona has played a central role in countless internationally-acclaimed novels, whilst many of the city’s neighbourhoods have also provided the backdrop to the life and work of a long list of outstanding authors. Discover the literary city and visit the “Barcelonas” of J.V. Foix, Mercè Rodoreda, Montserrat Roig, Terenci Moix, Vázquez Montalbán and Juan Marsé! Barcelona's exciting history can be examined through water and the various supply systems the city has had over the ages, a good deal of whose remains have been preserved. Besides this, advances in hydraulic engineering have made it possible to carry public works such as the reclaiming of the River Besòs. Water is a scarce resource in Barcelona and these days considerable effort is being invested in ensuring it is efficiently consumed. Barcelona is like an enormous film set and the city has been immortalised for eternity on the big screen. This purpose of this route is to help you discover this cinematic city under the guidance of internationally renowned directors such as Ventura Pons, Pedro Almodóvar, Woody Allen and Alejandro González Iñárritu, in the company of actors who have become living legends including Jack Nicholson, Javier Bardem and Penélope Cruz. The mark on Barcelona left by Antoni Gaudí's genius goes well beyond the Eixample and Park Güell. Districts such as Les Corts, Sarrià-Sant Gervasi and Gràcia hide away little-known works of his that reveal new sides to the him and the city. There are plenty of surprises in store for you on a tour of Gaudí's least-known works! 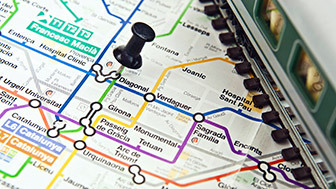 Barcelona has an extensive public transport network that connects all its neighbourhoods.